Continuing the previous post of 1996 Jeep Grand Cherokee Laredo SYSTEM WIRING DIAGRAMS Exterior Lamps Circuit part 1, here I post the next schematic wiring diagrams for 1996 Jeep Grand Cherokee Laredo SYSTEM WIRING DIAGRAMS Exterior Lamps Circuit part 2. 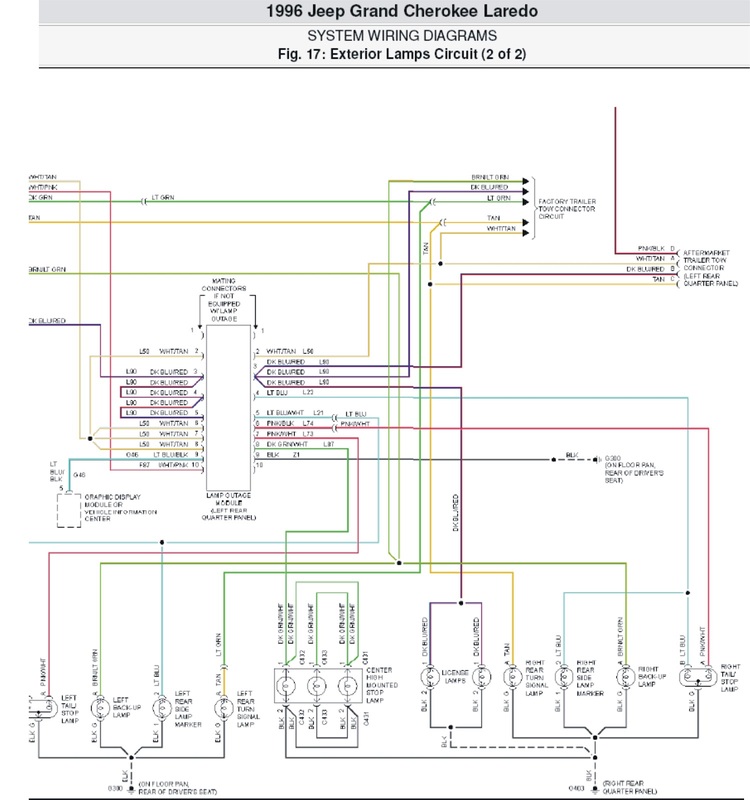 As in the first part, you must comprehensively understood the parts/component mentioned in this schematic wiring diagram. Those parts/components including: factory trailer tow connector circuit, mating connector, graphic display module, lamp outage module, left tail/stop lamp, left back-up lamp, left rear side lamp marker, left rear turn signal lamp, center high mounted stop lamp, license lamps, right rear turn signal lamp, right rear side lamp marker, right back-up lamp, right tail/stop lamp. Pay attentions also on the color codes in this schematic wiring diagram to minimize the faults. I hope this post can help you. So, here is the 1996 Jeep Grand Cherokee Laredo SYSTEM WIRING DIAGRAMS Exterior Lamps Circuit part 2. Click on the image to enlarge.